Date: 17th May 2010 (Monday), 12:39 p.m. This is my favorite shot! Can you feel the natural 3D effect in this picture? I can't believe how real the statues look!!! Date: 17th May 2010 (Monday), 11:46 a.m.
No words can describe the beauty of these sculptures. Date: 17th May 2010 (Monday), 12:30 p.m.
A close-up shot. 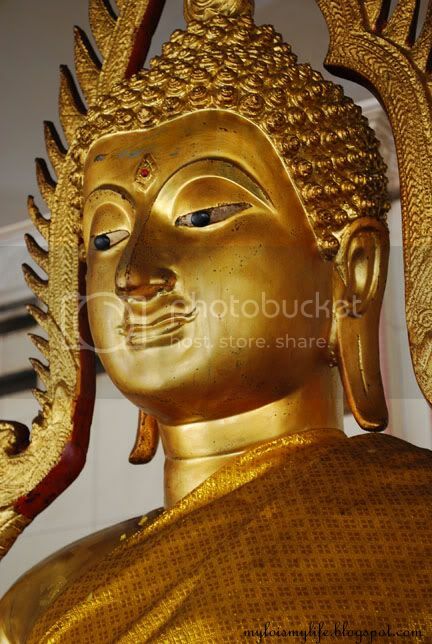 One of the 18 Buddha statues holding alms bowl. Some of these bowls were overflowing with cash! 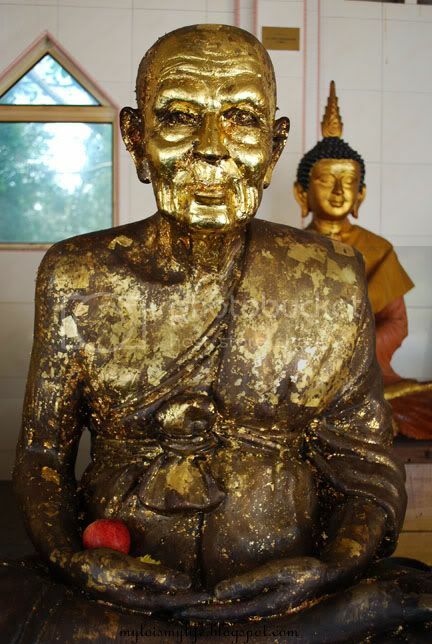 Date: 17th May 2010 (Monday), 11:28 a.m.
God idols placed right next to the temple's Bodhi tree. Date: 17th May 2010 (Monday), 12:29 p.m.
Ganesha: Lord of Beginnings. 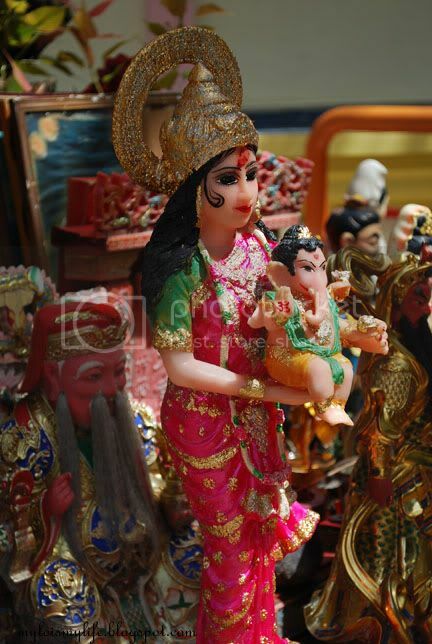 In Buddhist Thailand, Ganesha is regarded as a remover of obstacles, the god of success. Date: 17th May 2010 (Monday), 11:45 a.m. 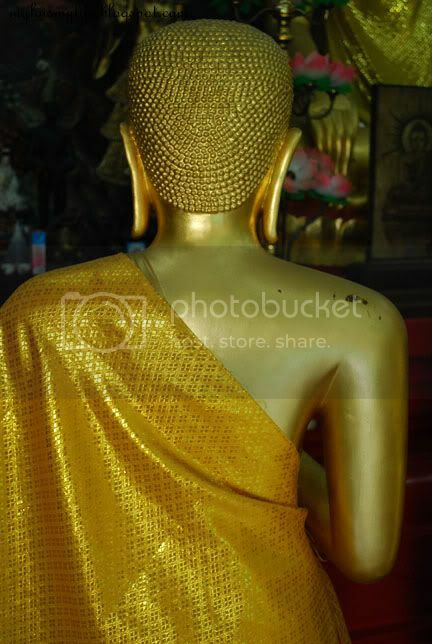 This picture was taken in the temple's Chedi which enshrines relics of Buddha and holy men. Date: 17th May 2010 (Monday), 12:33 p.m.
Also known as Kalai Kedah. This statue was sponsored by Mr & Mrs Tan Eng Wan. Each piece is hand carved with perfection while the curves of the bodies are life like! Date: 17th May 2010 (Monday), 11:39 a.m. I believe these statues were created after a revered monk or holy person. Date: 17th May 2010 (Monday), 12:32 p.m. 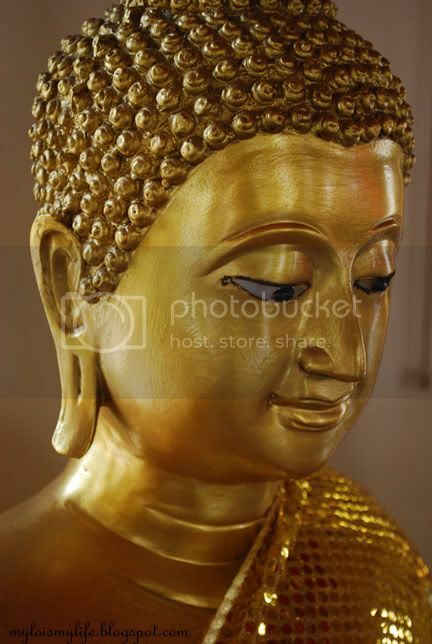 The peaceful look on the Buddha face would stay with me for a long time. His posture and fine finishing adds to its beauty. "Great compassion makes a peaceful heart. A peaceful heart makes a peaceful person" A quotable quote. Date: 17th May 2010 (Monday), 12:35 p.m. 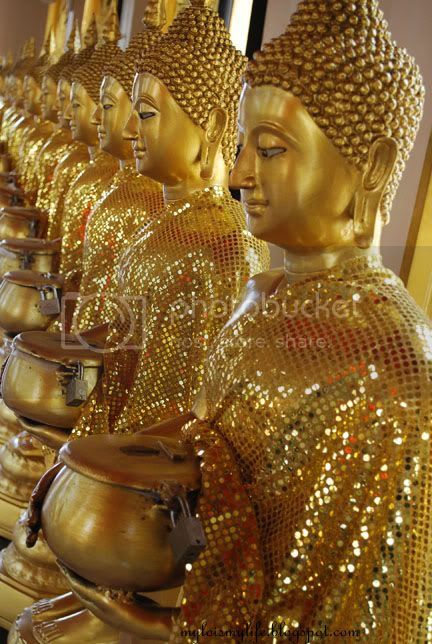 The 18 Buddha statues with alms bowls. 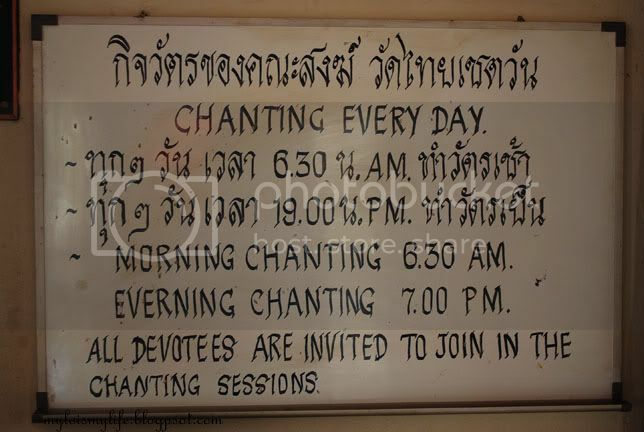 I didn't have any idea a decent Thai temple existed in Petaling Jaya, Malaysia since the 1960s. It was recommended to me by a fellow facebooker. Recently I had an eerie and disappointed experience in Wat Meh Liew. So I was reluctant at first. Not sure if it's worth the visit. I need to find out more about this place before making any decisions. Wat Chetawan (Thai: วัดเชตวัน) is labelled and pictured as one of the larger and established temple. That sounds good to me. A perfect place for Thai Buddhism. I have to see it to believe it. There are too many articles written day-in and day-out which don't reflect the true picture. I boarded a bus to Central Market, Kuala Lumpur (KL). After that, I proceeded to Pasar Seni LRT station and reached Taman Jaya station in 20 minutes time. Next, I walked almost 900 m to Wat Chetawan. I rely on Google Maps. It's amazingly precise, easy to use and understand! I walked along the beautifully designed pedestrian walkways, take some photos, and generally enjoy a crisp and quiet morning. Halfway, I stumbled upon a patrol car. The officers looked at me suspiciously. I ignored them and head towards the temple. I suddenly felt intimidated by their presence. LOL! It was supposed to be a reassuring feeling to me but it's not. This is Jalan Pantai (off Jalan Gasing). An area littered with multimillion mansions. So I'm not surprised to see special attention from law enforcement officers. At that time, I was the only person walking. Perhaps the police officers were thinking "Apa pulak orang ni jalan seorangan kat kawasan orang kaya" (English: "Why is he walking alone on this filthy rich area?"). Do I have to drive a flashy car and struts my LV bag? It's better for them to monitor the Mat Rempits (an individual who participates in illegal street racing). I think they misunderstood my camera bag as some stolen goods from the rich mansions. LOL! I saw a huge temple complex from afar. My heart was beating fast! This should be INTERESTING! I took the back pedestrian entrance and walked all the way to the front gates. Volunteers and monks were out in full force preparing for this year's Wesak Day, which falls on 28th May 2010. I wanted to snap some portrait shots but the monks felt uneasy. Oh well. Next, I walked towards the gigantic Bodhi tree at the middle of the temple complex. Around 50 God idols and statues (Guan Yin Goddess of Mercy 觀音, Ganesha - Lord of Beginnings and others) were placed right next to the tree. A typical scene in almost all Thai temples. Can someone enlighten me on why these Gods were placed there? WOW! Why so serious? I was absolutely dumbfounded by his hostile 'attacks'. Despite the apprehensive atmosphere, I managed to maintain a warm and friendly persona. I was able to remain relaxed and maintain my composure. I explained this and that. I even offered my blog address for reference purposes. I'm no trickster...OK? Luckily our conversation became friendlier after some lengthy cross-examination. LOL! He told me he is a Thai royalty (somewhat related) and one of the chief admin in the temple. We exchanged some ideas before parting off. Later I found out this temple was indeed built by request from a renowned and revered Thai monk The Venerable Phra-Kru-Palad Vieng. There is a framed wall photo showing Thai King Bhumibol officiating the temple. 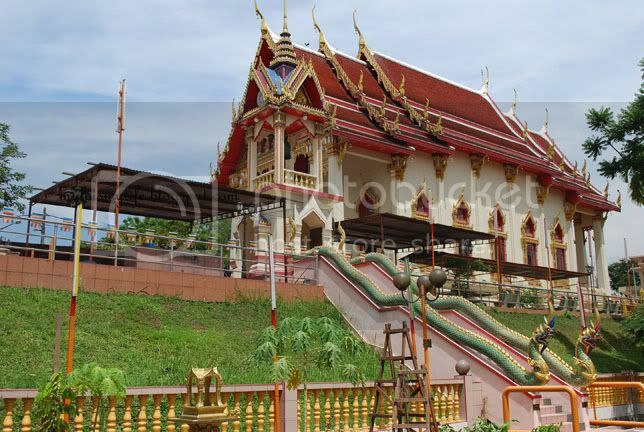 According to Buddhistchannel, King Bhumibol Adulyadej of Thailand performed the ceremony of raising the main chor fah of the temple which is vital in the building of a temple. 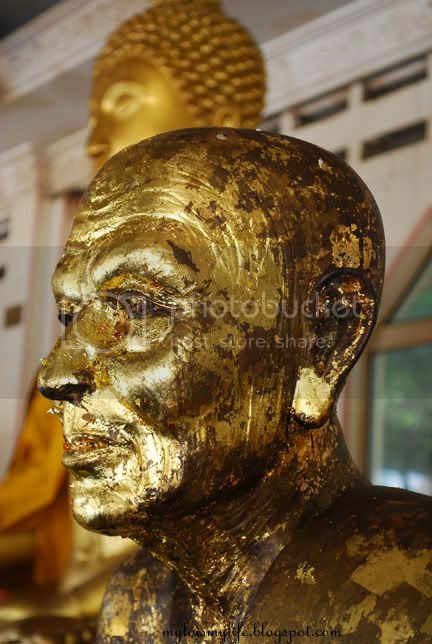 The Thai king also brought a statue of Buddha named Luang Pho Putthak Thammin from his Royal palace and donated it to the temple. WOW! That's AWESOME! After that, I proceeded to the main praying hall a.k.a Ubosot. It was hot but windy. I saw a line of Buddha statues at the left -hand corner of the temple. These statues are holding locked alms bowls. 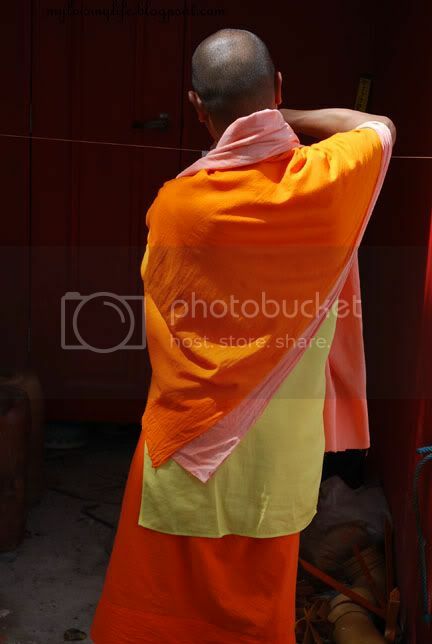 A plump Thai monk emerged from the hall. I nodded my head with respect and we exchanged smiles. Later I spent another half an hour exploring Guan Yin Shrine and monk chambers (sala). Overall, Wat Chetawan is a simple and beautiful Thai temple in Petaling Jaya, Malaysia. I LOVE the simplicity. Definitely worth the visit. But then again, this is nothing compared to Wat Pho (Thai: วัดโพธิ์), Grand Palace (Thai: พระบรมมหาราชวัง) and Wat Arun (Thai: วัดอรุณ, Temple of the Dawn) in Bangkok, Thailand. Note: The temple management is organizing three days long Wesak Day celebration. Scroll down to find out more. Good news to all my readers. You may get the latest updates from my official Facebook page. Click HERE. Please join me and 'like' my page. Nearest LRT Station: Taman Jaya. Within walking distance (about 900 m). Click image below to view walking directions from Taman Jaya LRT station to Wat Chetawan Thai Temple. 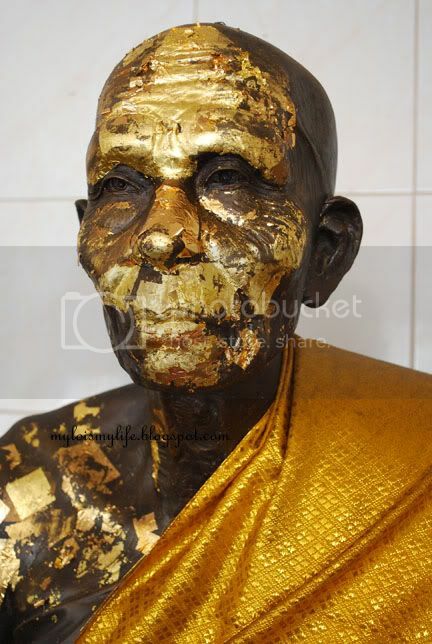 In this video: Chedi which enshrines relics of Buddha and holy men. not only penang, kl and selangor also have such nice decent thai temple ya... good!! 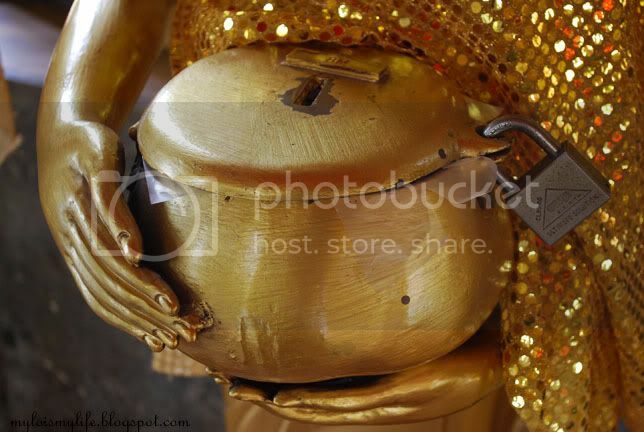 i extremely love picture buddha & his alms bowl :) and the bowls are locked, i think only msia right?? ahh.. this temple is always known as the big Thai Temple to me. it looks golden and shiny from outside. haven't stepped in before.. so this is what we can see inside. Hi Criz and welcome back! Thanks for the compliment! I still LOVE both Wat Chaiyanmangalaram Thai Temple and Dharmikarama Burmese Temple in Penang. Two beauties from the Pearl of The Orient. Locked alms bowl? Well that's a first :) Actually, I'm OK when ordinary people like us staring. But police officers staring at you? That's kind of creepy! A very nice temple! It seems like they are doing renovation in the backyard. The floor is so clean and shining! Indeed this temple is well maintained comparing to the previous temple that you visited. 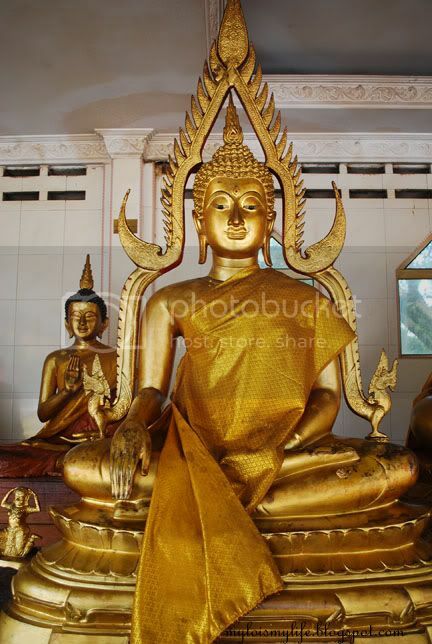 I like the picture of "Buddha & his alms pot". 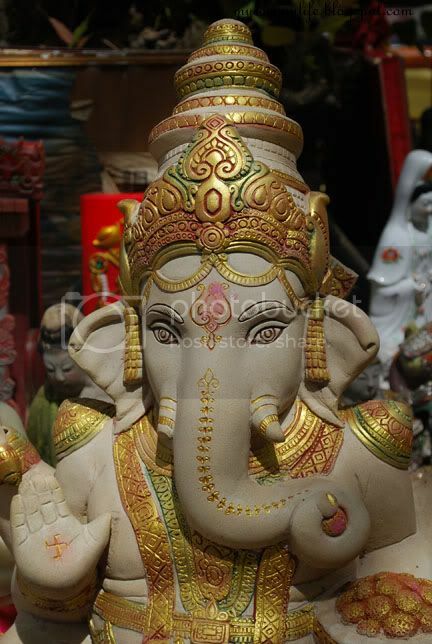 I think the Elephant God (Lord Ganesha) is very uniqe! I thought it was i Thailand at first because you included those Thai scripts. Those holy monks looked so real, like they're being mummified!?! Did you smell something funny there? 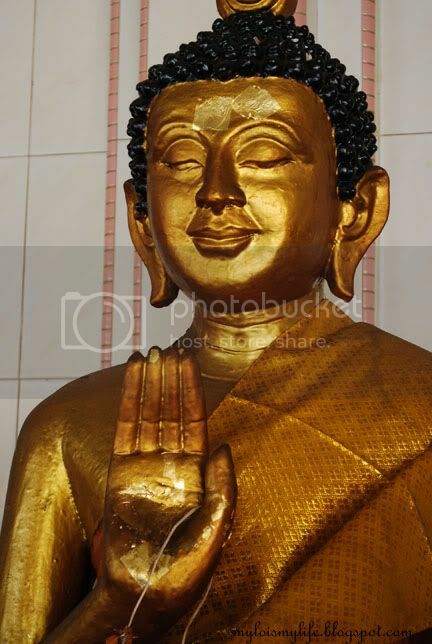 What 18 Buddha statues each holding an almsbowl? Definitely a decent Thai Buddhist temple. WOW! You have eagle eyes!!! They are building Maitreya Buddha's Pagoda. Donations are much appreciated. Names of donors with donation of RM500 and above will be displayed in the Pagoda. Glad you like those pictures! The smell was OK. Nothing too overpowering. 18 bowls? LOL! It's the 'fatt' or prosperity number. I think I'll put 10 cent each :) RM0.10 X 18 = RM 1.80 also 18 LOL! You have been visiting a lot of temples lately. This temple can rival the temples in Thailand and Laos. I like the 'Buddha & his alms pot' shot, it reminded me of your parrots shot in bird park. Traveling & photography are the most rewarding & enriching experiences in my life. Photography is all about discovery, enjoying myself, having adventure, learning people & nature. The greatest experience for me is the connection I felt with NATURE. If you haven’t seen Malaysia, you haven’t seen the world! 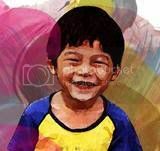 My photography works are licensed under Creative Commons Attribution-NonCommercial-NoDerivs 3.0 Unported.